+ATK: Sonya benefits immensely from receiving an Attack Asset to build upon her solid base Attack stat of 33 and bolster her raw damage output, allowing her to solidify her already potent OHKO capabilities. SPD: Although a Speed Asset can a decent option to develop her ability to regularly perform follow-up attacks, she will generally receive greater returns from investing in her Attack stat instead to capitalize on her primarily OHKO-dependent playstyle, making it best to simply leave her Speed stat untouched. RES: Sonya’s base Resistance stat of 32 is rather solid, allowing her to make reasonable use of Ploys in addition to making her quite adept at handling opposing mages. However, elevating it further with an Asset is not as important as raising her Attack stat and should be left neutral. -HP / DEF: Sonya’s physical bulk is absolutely horrendous, allowing her to safely take a Flaw in either stat as lowering it further will hardly affect her overall performance. An HP bane can be a particularly good option if making use of an AoE Special build to more easily allow her to receive Infantry Pulse support. This set aims to capitalize on the power of Sonya’s legendary tome, Dark Excalibur, an incredibly potent personal weapon that grants her a flat +10 damage increase whenever her Special activates -- and what’s more, its unique weapon refinement allows her to utilize this effect quite frequently, providing her with -2 Special cooldown at the start of the first turn. When utilized properly, this combination of effects enables her to be entirely self-sufficient, being much less reliant on receiving team support in order to function properly in contrast to some of her direct comparables while still possessing tremendous destructive potential. Given this build’s primarily OHKO-dependent playstyle, an Attack Asset is highly recommended here to augment her raw damage output as much as possible. For her Special, those with a two-turn cooldown will be her strongest (and most consistent) options thanks to their fantastic synergy with Dark Excalibur’s effects and Special Spiral. When utilized in tandem, such Specials will be fully charged at the start of every round of combat -- not only does this ensure her ability to consistently benefit from Dark Excalibur’s +10 damage boost, but it also functions as a way to circumvent her middling Speed by capacitating her to simply kill her opponent before they can even counterattack, thus eliminating the need for her to perform a follow-up attack in most scenarios. As for which Special to actually use, however, Glimmer offers her the strongest damage potential of her available options, though her native Moonbow can also be taken to help against magically bulky foes. Moving on to her main skills, Death Blow 4 is Sonya’s ideal choice of A slot skill as it grants her the greatest boost to her Attack stat possible, allowing her to push her raw damage output to exceptionally high extents. However, should Death Blow 4 be unavailable, Death Blow 3 or her native Mirror Strike can make for acceptable budgetary alternatives. Special Spiral composes the crux of this build and is necessary in order for Sonya to consistently make use of Dark Excalibur’s effect without being reliant on her ability to consistently perform follow-up attacks. Odd Atk Wave and Even Atk Wave are particularly standout candidates for her C slot, and serve to heighten her self-sufficiency even further with the massive +6 Attack buff they provide her with on odd and even-numbered turns respectively. With a strong base Resistance of 32, Sonya’s can also make great use of Ploys, with her native Res Ploy being her preferred option here to similarly enhance her damage output. Otherwise, her C slot can be filled with any skill that best compliments her chosen team composition. Lastly, since she has no need to utilize Quickened Pulse thanks to her unique weapon refine, Sonya can take the Attack +3 seal or any of its variants to gain a solid boost to her offensive potential. This build takes a slightly more unconventional approach to Dark Excalibur and its unique interactions with AoE Specials. Although this set does require additional setup to function properly in contrast to the first, it conversely enables Sonya to possess exponentially stronger and more applicable offensive capabilities, in large part due to AoE Specials’ ability to effectively bypass the Weapon Triangle entirely. That being said, aside from the aforementioned setup, two other specific skills are also required in order to ensure this build’s effectiveness: Special Spiral and the Heavy Blade seal. Following their initial activation, AoE Specials will only have a two-turn cooldown thanks to Special Spiral’s effect, which in combination with the Heavy Blade seal, allow for them to consistently activate in every round of combat -- combined with Dark Excalibur's +10 damage boost upon Special activations, this practically guarantees that Sonya will be able to quickly decimate any foe who dares cross her path. Despite detracting significantly from her overall bulk in addition to disallowing her from making use of Ploys, Life and Death remains Sonya’s ideal choice of A slot skill as the calculation for AoE Specials’ damage is based solely on visible stats and does not account for in-combat boosts, making Life and Death’s flat +5 Attack exceedingly valuable. However, should one wish to preserve her bulk in the case that she needs to take a single hit from an opposing mage in the Enemy Phase, or if aiming to make use of Ploys, Death Blow makes for a powerful alternative, offering her a substantial boost to her raw damage output as well as her ability to OHKO a weakened opponent; it also allows her to activate the Heavy Blade seal much more reliably. Odd Atk Wave and Even Atk Wave are once again stellar options for her C slot thanks to their ability to make Sonya much more self-sufficient, however, they are not strictly necessary for her to function properly and can be replaced by any other skill that complements her teammates’ needs. Alternatively, she can also take a Ploy of one’s choosing, provided that she is not using Life and Death as she will otherwise not have enough Resistance to reliably activate them against opposing foes. In particular, although Sonya should rarely (if ever) be taking damage with this build, Atk Ploy can still be a suitable choice for her C slot skill as it strengthens her ability to consistently activate Heavy Blade. Her native Res Ploy is also a great option to enhance her raw damage output. Otherwise, any skill that complements her teammates can be used here. As for her choice of AoE Special, Blazing Wind is her overall best choice due to its wide radius giving her the greatest chance of inflicting damage to more foes with one hit. In exchange for losing out on some of Blazing Wind’s damage, Growing Wind can also be considered should one wish to inflict AoE damage upon as wide a group of opponents as possible. However, depending on personal preference, Blazing Light or Blazing Flame may be preferred, thus allowing her choice of Special to be flexible. Joining the already bloated pool of infantry green mages, Sonya manages to distinguish herself from her competition through her unique tome, Dark Excalibur. It grants her an impressive +10 damage whenever she activates her Special, allowing her to reach high levels of damage output while still remaining fairly self-sufficient -- a characteristic that is only enhanced further through its unique weapon refinement which, when utilized in tandem with Special Spiral, ensures that Sonya will consistently be able to activate her Special frequently and benefit from her tome’s powerful damage boost in every round of combat. Furthermore, her Attack stat is quite solid and inherently provides her with the means to make exceptional use of Dark Excalibur. Her base Resistance stat of 32 is also respectable and gives her good matchups against fellow mages as well as the ability to use Ploys and Resistance-scaling Specials effectively. 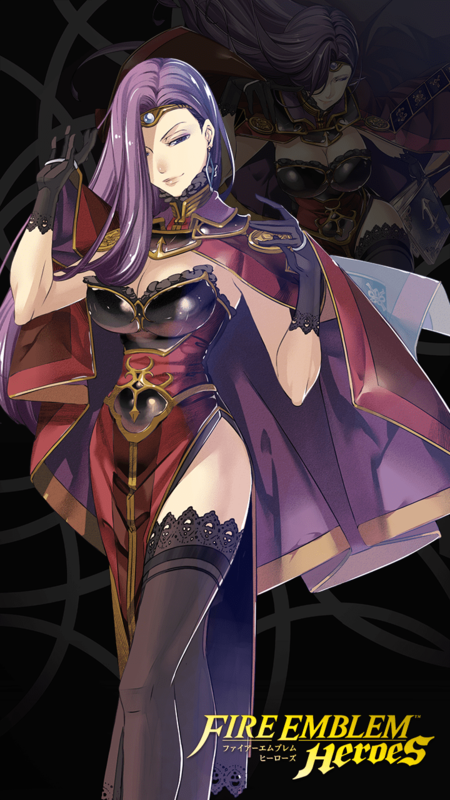 Conversely, however, Sonya possesses markedly low physical bulk that leaves her susceptible to Distant Counter users she does not possess Weapon Triangle advantage over or whom she cannot OHKO, most notable of which being high Resistance tanks; opposing archers and dagger units can also prove to be quite troublesome for Sonya in the Enemy Phase. Nevertheless, Sonya’s weaknesses are not substantial enough to truly detract from her effectiveness heavily -- with a fantastic personal weapon and refine, a good Attack stat, the ability to perform effectively without being reliant on team support to function, and undeniable charm, Sonya is an exceptional, self-sufficient offensive frontliner who stands tall as one of the most powerful green infantry mages around and will undoubtedly be a great boon to have in any team composition willing to take her. Sonya’s unique tome sets her apart from the other plentiful green infantry mages available and allows her to attain incredible destructive power right off the bat, gaining a flat +10 damage boost upon Special activations in addition to -2 Special cooldown on the first turn when refined. In contrast to a vast majority of her direct comparables, Sonya is not reliant on team support for her damage output -- thanks to the advent of Special Spiral, Dark Excalibur’s unique weapon refine enables her to unleash devastating Special activations upon unsuspecting foes in every round of combat and obtain impressive offensive potential, all without needing the assistance of another unit to do so. Sitting on a solid base Attack stat of 33, Sonya is on the higher end of Attack stats in comparison to other green infantry mages. This coupled with Dark Excalibur’s effects allows her damage output to be extraordinarily high to shred through opposing foes with relative ease. Sonya’s strong base Resistance stat of 31 allows her to be quite good at dealing with other mages and enables her to use Resistance-scaling and Ploys to great effect, the last of which can be used to help improve both her and her teammates’ overall performance. Sonya’s combination of low HP and low Defense causes her to crumble to most forms of physical attacks, making it crucial that she be kept out of harm's way from physical damage dealers in the Enemy Phase. Although Sonya can perform reasonably well at lower levels of investment, her overall effectiveness suffers immensely when unable to benefit from the effects of premium skills such as Death Blow 4 and Special Spiral to truly capitalize on her offensive potential, leaving her liable to struggle in carving a niche for herself should such skills be unavailable. As a unit who functions primarily in the Player Phase, Sonya appreciates the ability to make multiple moves, making refreshers a great choice of ally. Units such as buffers and those who commonly use Infantry Pulse similarly help improve her overall performance. Strong blues who can provide Weapon Triangle coverage are also a good option. Refreshers: Sonya benefits greatly from the ability to move again as this gives her the option of either picking off another opponent or to safely escape from enemy range, making refreshers like Ninian, Performing Azura, Olivia, and Bridal Ninian excellent allies. Buffers: Though Sonya has the ability to be relatively self-sufficient, units like Sanaki, Marth, and Eirika who can provide her with buffs to her offensive stats can come a long way in boosting her offensive potential. Infantry Pulse: Dark Excalibur’s effect makes Sonya’s Special activations frighteningly powerful, and units such as Nowi, Fae, Hinata, Karel, and Dorcas who commonly use Infantry Pulse are a good choice of an ally in order to speed up the rate at which her Special activates if making use of an AoE Special build. Strong Blues: Units such as Ephraim, Shiro, and Linde who cover Sonya’s general weakness to reds and provide Weapon Triangle coverage are also an option. Red magical tanks are hard counters to Sonya as they can easily take her attacks and then KO her on the counter. Anti-mages are also able to dispose of her with relatively no issue, in addition to strong physical hitters who exploit her low physical bulk. Magically Tanky Reds: Units such as Sanaki, Halloween Myrrh, Flora, Idunn, Julius, and Winter Tharja are able to withstand Sonya’s attacks and then retaliate with great force. Anti-Mages: Felicia, New Year Takumi, Nina, and other similar units all have the ability to put a quick stop to troublesome mages with Sonya being no exception. Strong Physical Hitters: Strong physical hitters such as Cherche, Cordelia, Tana, Elincia, Klein, and Soleil tear through Sonya’s poor physical bulk and can easily kill the youthful mage, provided that they initiate combat. This built is made solely for AR defense team and the aim is to destroy the opposing Super Tank. Rally resistance is just a budget for rally trap. Any defensive rally skill is fine. Be careful with atk n spd rally coz Aversa will completely ruin it. I chose Luna over Glimmer or Glacies for its res penetration and I had an infantry pulse on another unit to proc instant Luna. It is very common in AR to see Super Tank with massive buffs from Corrin or Kaden and two Eir during Light season which made specials like Glimmer totally meaningless. I mean 0 x 999 is still 0. Deathblow 3 since I don't have DB4 and you need all the power u can get. Spd is not really super important since hers is not that impressive anyway. You are aiming at that one hit potential. I don't have Special Spiral and since I run Luna, it's not essential. Guard is a very good alternative coz it denies their recovery specials like Noontime if they were to survive your nuke. You can also give chill res if your team doesn't have it. C is flexible. I gave her a drive skill to buff my team's tank. And for S slot, bond skills in general are very good in AR def team even if the user is a range unit. If you have a melee unit in front of her or wing of mercy or guidance support, she will most likely be adjacent to another unit when she attacks. "Me, vicious? You are the one who feeds yourself the most lies." "My particular talent is to hide it." ?? Spellbook n°2 : Lord of Vermillion ?? This is more of a fun build and to retain her abilities from ( Gaiden/Echoes ) but you can replace "WoM" with "G.Tomebreaker" so she can decimate green units. I pair her with an Infanty Pulse Nowi so that she starts with her special ready. Slot A: Death Blow. For maximum damage. Slot B: Wrath. For maximum damage. Slot C: Res Ploy. Base skill, also helps damage for her and Nowi. Overall: Fun OHKO Sonya that goes well with an infanty Wao Dao unit like Athena or Olivia. Dark ExcaliburGrants +10 to damage when Special triggers. Mirror Strike 1Grants Atk/Res+2 during combat if unit initiates combat. Mirror Strike 2Grants Atk/Res +4 during combat if unit initiates attack. Res Ploy 1At start of turn, all foes in cardinal directions with Res 1 or more lower than unit suffer Res-3 until the end of foe's next action. Res Ploy 2At start of turn, all foes in cardinal directions with Res 1 or more lower than unit suffer Res-4 until the end of foe's next action. Res Ploy 3At start of turn, all foes in cardinal directions with Res 1 or more lower than unit suffer Res-5 until the end of foe's next action.